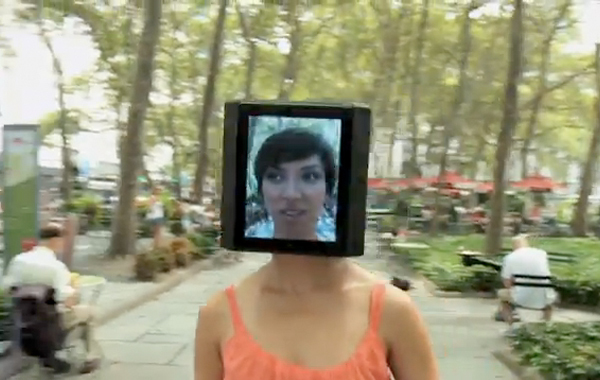 New Yorkers are brave and bold people that aren’t afraid to shout “WTF” at some strange sh*t. So you can only imagine what was bellowed when they caught a glimpse of the “iPad Head” girl as she strolled through Bryant Park. The woman is busy promoting a magazine titled Cosmo for Guys from publisher Hearst, which stems from a creative concept built by viral marketing agency Thinkmodo. Homegirl’s headgear consists of four iPads shaped in the form of a cube that projects video playback of each side of her head. Check her out on the streets of NY in the clip below.